· Wash and soak black chenna dal for 6 hrs. · Strain water from it completely and store it in a air tight container. · Refrigerate for 3 days and wait for the sprouts to appear. · After 3 days, you can see tender nutritious sprouts emerged from it. · Pressure cook it for 2 whistles. · Take a dry pan, roast sesame seeds and keep aside. · Now add 1 tsp oil to the pan, roast red chilly to fragrant. 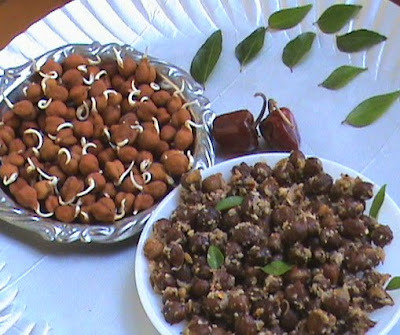 · Heat 1 tsp oil in a pan, temper with mustard, curry leaves, asafoetida and split urad dal. 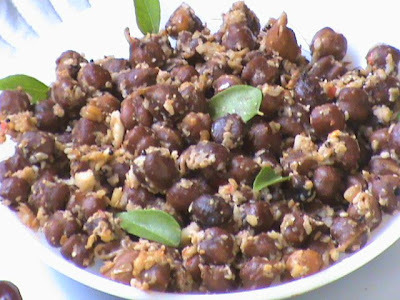 · Add cooked black chenna dal, mix completely. 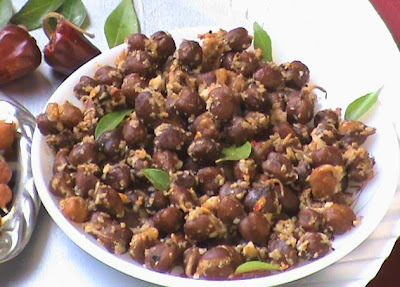 · Add coarse masala pwd, salt and combine. · Add thick coconut milk, stir continuously in medium flame. 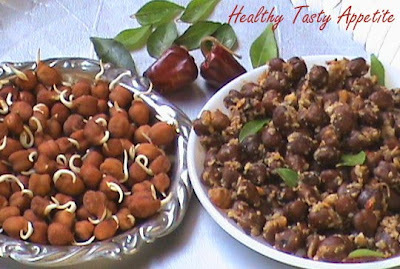 · Serve hot with coriander and curry leaves garnishing.